An elegant club of yesteryear in the heart of Brianza. Warm, cosy, exclusive, with rich fabrics and wood decorations, artworks hanging on its walls and beautiful porcelain from another era… we are talking about the indoor hall of our popular bar. Today it has been rebaptised as the Derby Bar to underline its continuity with the old Derby Grill, the award-winning restaurant, “reign” of Chef Fabio Silva. The Derby Bar is ideal for a light and informal lunch based on some traditional Italian dishes, but especially for cocktails, aperitifs and after-dinner drinks. It has always been one of the most beloved bars in Monza and is a must for those that want to enjoy unique aperitifs and business breakfasts, romantic after-dinner drinks and luxurious cocktail parties. It is also perfect for those occasions in which the location, the service and the high quality of the offer can and must make a difference. Experience, creativity and passion for an exclusive offer. The location definitely makes the difference, but without a selection of food and drinks at the same level, it would count very little. 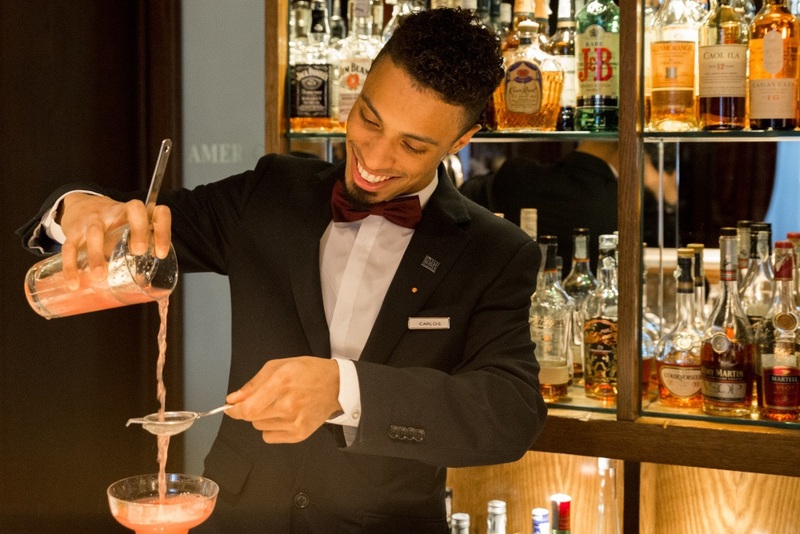 Carlos Rosa, bartender of the Derby Bar, will delight you with the great classics revisited, will propose wines, sparkling wines and champagne as aperitif (accompanied by tapas signed by Chef Fabio Silva), and will suggest the best liquor labels for after-dinner drinks and a relaxing time. All this will be accompanied by an offer of snacks and casual and light lunches and dinners to enjoy in the warm atmosphere of the library or in the cosy environment created by the colonial veranda.